Firewood has been used as a source of fuel for thousands of years. Many homeowners still use it today because it is fairly available and therefore more economical considering the rising costs of other energy sources. Moreover, manufacturers have also developed better and more heat-efficient wood furnaces, making firewood use even more attractive to many homeowners. However, if you have to buy your own firewood, sometimes these costs add up and you may find yourself having to spend hundreds of dollars to get quality firewood especially during the winter. Learning how to cut up logs into firewood on your own will definitely save you a lot of money especially if you live in a region where trees are in abundance. This article is intended to guide a homeowner or any new chainsaw user who intends to use a chainsaw to cut logs for firewood, to clear debris after a storm or for any other uses. Obviously, you will need to find a good chainsaw. You can either use a gas-powered chainsaw or an electric chainsaw but your choice will definitely depend on the sizes of the logs you intend to cut and the environment where you will be cutting the logs. 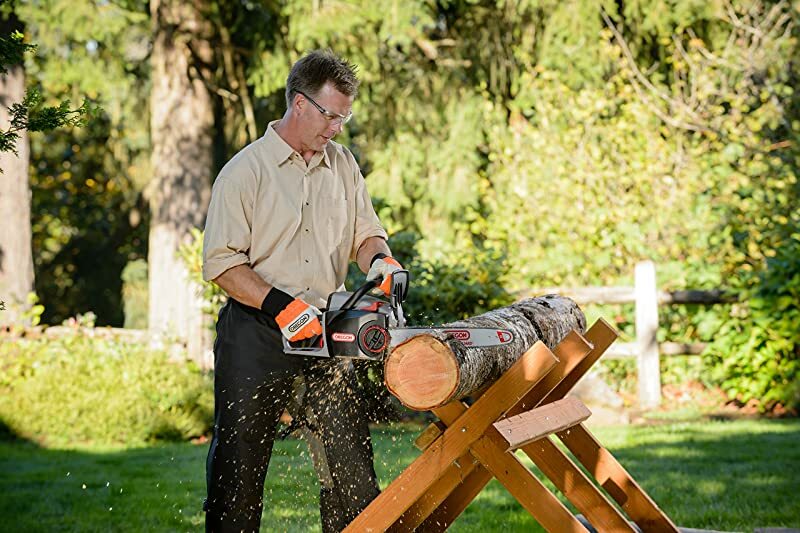 If you will be cutting up large logs, or logs from large fallen trees, you may require a gas-powered chainsaw as they are technically designed to handle heavy duty logging and other chainsaw uses. Most electric (corded) chainsaws are however designed with enough power to handle most of the chainsaw needs of a typical homeowner. Their main disadvantage only being that they must be attached to a power source which makes them unsuitable if you will be cutting up logs in a place where there is no nearby power source. For an average homeowner, a chainsaw with a 16 inch bar length will be enough as such a saw size is not only minimal weight but also able to provide enough power. Once you decide on what type and model of chainsaw to use, you may also need to gather up a few other tools including a plastic wedge, an iron wedge, a splitting maul, or a sledge hammer. These additional tools will help you split the logs into usable parts. Some homeowners may easily find logs to cut in their backyards but other chainsaw users may have to venture a bit further to find logs to cut. Trees and large branches tend to fall during storms and if you do not have fallen trees in your backyard, you may need to inquire with your neighbors or venture out into the woods. In most cases, you will not have to look far to find fallen trees and branches. Most landowners will allow you to cut their fallen or dead trees for a small payment, a small portion of the wood you cut or even sometimes for free. However, be sure to know which trees you are permitted to cut, where you can access them and exactly what you will do with the debris and remaining twigs. It is however important to avoid felling trees especially the larger trees if you do not have enough experience or when you do not feel comfortable doing so. Chainsaw use is not without risks. Make sure to read the manufactures safety guidelines usually contained in the operators manual. Basically, you will need to invest in personal safety gear including chaps, gloves, safety glasses, a helmet, protective boots and hearing protection especially if you will be operating a gas-powered chainsaw. Make sure that none of the safety gear you wear obstructs your operator when using the chainsaw. It is also important to go with someone else and carry communication gadgets and maybe have a vehicle nearby that you will use in case of emergencies. When operating a chainsaw, make sure that you are standing in a good position that helps you maintain a good posture at all times. Your feet should be spread wider than your shoulder length; as such a position will enable your upper body support the chainsaw more comfortably. This will also prevent fatigue. Make sure that there is nothing around the area where you are standing that could make you lose your footing. You must also concentrate on the task at hand as even the slightest distraction can cause you to lose balance which could result in dire consequences. You can either cut upwards or downwards. In most cases, cutting downwards (placing the chainsaw above the wood and cutting through it) is convenient as gravity usually pulls the cut wood downwards. However in some situations where the branch or log is under a lot of tension, cutting downwards may cause the saw to get pinched and get stuck. In such cases, you may need to cut upwards (placing the chainsaw below the wood and cutting upwards through it). A plastic wedge can also be used to prevent larger logs from pinching the chain. When cutting a fallen tree, it is best to cut the braches first before moving to the trunk of the tree. Cut of all the small branches that may not be useful for firewood by placing the blade of the chainsaw at the base of these branches so as to get smooth cuts. Find larger branches that could be holding the tree trunk above the ground as such branches act as supports; elevating the trunk for easier cutting. 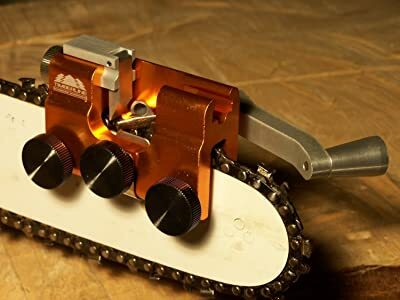 This will also ensure that your saw chain will not come in contact with debris or dirt which will could dull it very quickly. Develop a plan for cutting the tree so that you can cut off the props last. Naturally, you will notice that the tree trunk gradually thickens as you progress from the branches towards the base of the tree. You may need to cut the wood in the shape of an A-framed house (in 45 degree slants) then cut directly in an upward or downward direction when both sides of the log are uniformly cut. Sometimes the trunk can be too heavy to lift off the ground and this can make it very difficult to cut the trunk as well as to keep the saw chain from cutting through dirt and debris. In this case, you will need to use the Half-Cut Technique. Pre-cut the trunk in the sizes of the firewood you want or any other manageable lengths and cut through leaving two or three inches uncut. Roll the trunk over until you can access the uncut side and then you can now cut through carefully until the cuts meet. 4. In case your saw chain is pinched and gets stuck when you are cutting up logs, turn it off. Try to pry it out gently with your hand if the pinch is in a small limb. If this does not work, you can disassemble the saw and pull it out until it comes free. If you have another saw, cut through the piece of the tree trunk that is causing the pinch. That being said, cutting logs using a chainsaw is not rocket science. However, it is important to note that chainsaws are dangerous tools that must be handled with care. If you feel that you are not comfortable using a chainsaw, have someone else who has experience in chainsaw use cut up the logs for you. In addition to this, avoid felling trees especially the larger trees if you are not a professional or do not have enough experience to do so. Just remember to maintain your chainsaw as recommended. Basically, ensure that you use the recommended type of fuel as well as the mixture ratios and ensure that the chainsaw has a sufficient supply of bar oil. You must also ensure that the saw chain is properly sharpened, tightened, and tensioned and that all the guards and shields on the saw chain are securely tightened and secured at all times. This will make the process of cutting up the logs easier, faster and also a whole lot safer for you.